Ah, Pee-Wee’s Playhouse, my favorite TV show when I was a kid. If you find yourself searching for some kitsch to deck out your own playhouse, perhaps this replica Clocky will do the trick. It’s a real, working clock, too. 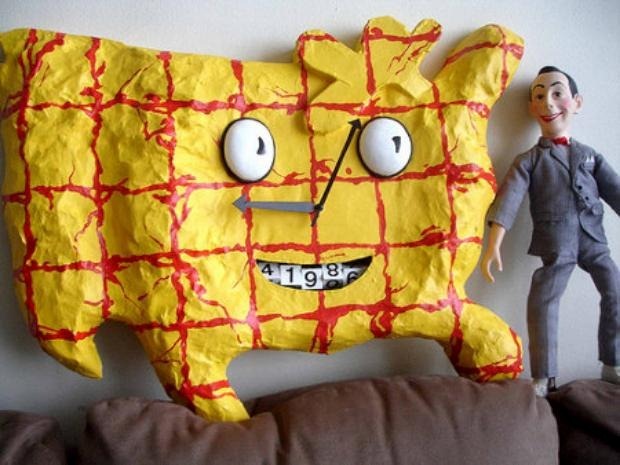 …It’s a one-of-a-kind, handmade paper-maché replica of Clocky from Pee-wee’s Playhouse, and it is a working clock. Made to hang on a wall. It is lightweight but sturdy, it measures just under 30″x20″ at its widest points. The Clocky pictured is not the exact one that the winner will receive, but it is basically the same in every way.